Family Dollar Stores Inc., operating over 6600 stores in 44 states, is a self-service discount retailer. The name is slightly misleading for many consider the “Dollar” in the name implies it is a “dollar store” – while many articles sell in the vicinity of $1 there are higher price points. The store carries lower priced items and a typical customer purchase total is around $10 per visit. Compared to big discount/wholesale retailers like Costco, Family Dollar operates small stores that gross less than $1 million on the average in sales. The first store opened in Charlotte, NC in 1959 featured closeouts and overruns from the textile mills of the Carolinas. Currently, consumable and discretionary items are offered at a lower price-point compared to other national retailers. They feature national brands, no-name brands, and private label store brands (Family Gourmet, Family Pet, Kidgets, etc). Although a large public Fortune 500 Company, management is definitely a family business. The founder Leon Levine retired in 2003 after handing over the reins to his son Howard R. Levine. To his credit, Howard did work his way from the ground up – he joined the company right out of college in 1981, pursued other options in the nine years between 1987 and 1996, rejoined in 1988 and has since been with the company for 22 years. Family Dollar’s patrons are decidedly lower middle class. The Annual Gross Income (AGI) of the majority is less than $40K and almost a quarter has an AGI of less than $20K. All stores are managed and operated by the store manager who is a full-time employee responsible for local hiring, training, and store management. Around 500 and odd stores are owned while the rest are leased. Direct employment stands at around 30,000 full-time and around 20,000 part-time. Benefits of restructuring the merchandising supply chain along with store level execution: The Project Accelerate SAS process implemented is partly responsible for Family Dollar adjusting rapidly to the recessionary environment by switching various inventory items from discretionary to ‘basic needs’. The ‘Store of the Future’ concept is another success story for Family Dollar helping with store level execution. Renovation program along with expansion of private brand: Family Dollar Stores launched an aggressive renovation program splurging upwards of $100K per store. It is too early to weigh the benefits of that program. Even with all these improvements, from an analyst point the same-store sales growth projection of 5-7% is pretty aggressive and hard to achieve. While hugely successful, the Project Accelerate SAS program does not have the amperage to drive growth perpetually. Furthermore, the advantage attributed to the new POS system (Store of the Future - acceptance of credit cards, food stamps, etc) that was the driving force for the growth in the previous years is expected to slow now that that rollout is complete. The discount retail industry Family Dollar operates in is highly competitive. They are squeezed between the dollar stores and the big-box retailers. Dollar stores offer direct competition, as they tend to be smaller-format stores too. Big-box retailers with their better selection and in many instances improved prices are able to pass-along huge volume discounts. But, as history has indicated, Family Dollar stores have thrived primarily because they are nimble – opening stores away from the big-box retailers gives them the edge with regards to location and convenience. Scoping such locations is harder while on a dash to open stores at an accelerated pace. Discriminatory pay practices with respect to the Company’s female store managers. Despite this, turnover in the company has improved but lot more work is needed. The financials over the last three years show an outstanding growth trend. The company has not only survived the US economic environment, but has thrived in it. Earnings growth in the mid-twenties along with net margin expansion shows that management has executed Family Dollar’s growth plans in a stellar fashion. Family Dollar scores 6/10 on its ability to beat inflation: Return on Equity is outstanding and Free Cash Flow is above average. Net Margin is very low although it is common in the industry. PEG ratio, a measure of valuation is rather rich at over 1.0. Corporate Abuse rating drags at 0/10 as their executive compensation is egregious: The CEO makes around $6M, roughly more than 250 times the average worker. Income Generation and Liquidity measure has an income bias which accounts for the 8.67/10 rating. The yield of 1.35% is decent for a growth company. The stock is optionable and very liquid. Moreover, the company grew earnings every year avoiding any negative surprises. Volatility ranking is a perfect 10/10: Both Beta and Debt to Equity Ratio are outstanding. Capacity to increase dividends almost fetched another perfect 10: The payout ratio and 5-year average earnings growth were outstanding at 0.22 and 12.7% respectively. Although dividends grew at a healthy clip of over 9%, it was still below the baseline 10% number thus accounting for the 9.67/10 rating. 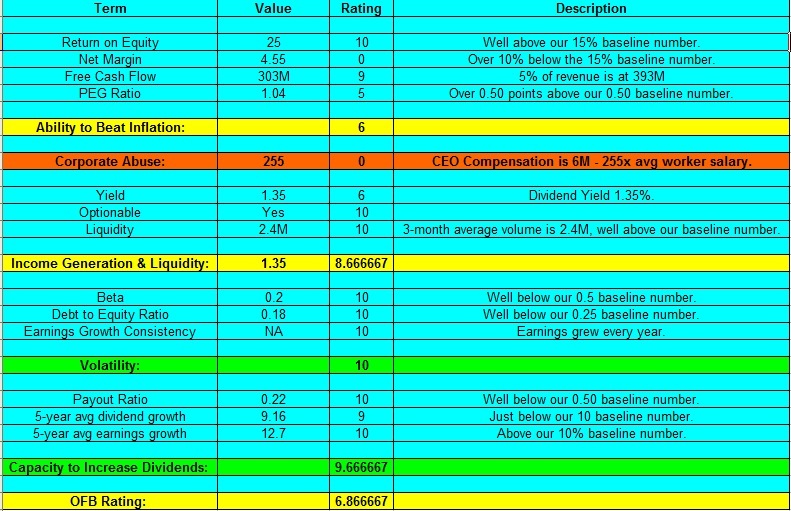 The overall quantitative rating or the ‘OFB Factor’ came in at 6.87/10, which is above average. Family Dollar has an enterprise value of $5.56B and a forward PE of 12.75. Historically Family Dollar grew at a healthy pace but the last two years has shown outstanding growth as a result of a number of business adjustments that management executed flawlessly. Going forward, the ambitious renovation program along with the continued benefits from its earlier efforts should help it maintain growth at a healthy pace. Family Dollar is projected to accelerate new store openings. Investors need to monitor the performance of these stores along with YoY (Year over Year) overall comp numbers to arrive at how the company is executing on these new growth initiatives. Investors need to carefully consider the risk factors of Family Dollar’s business. Despite their impressive growth in the last few years, truth is that the discount retail industry is a largely saturated group in the US with very few barriers for entry. These two factors results in a low-margin business. Though Family Dollar has been able to expand margins in the last few years they will hit the ceiling sooner than later. 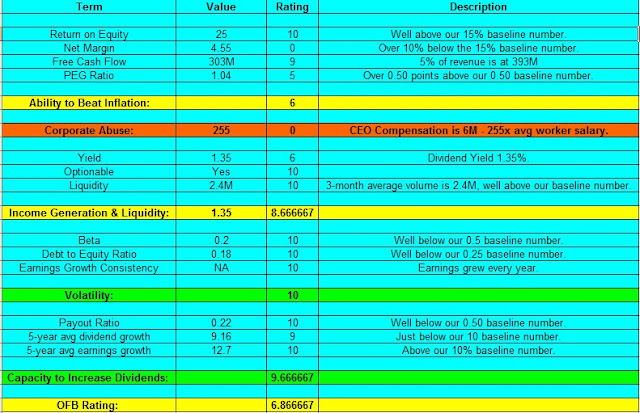 As the PEG number of 1.04 shows (see quantitative analysis spreadsheet above), the company is fully valued. Although our quantitative analysis showed the company as having an ‘Above Average’ rating, risk factors and business issues are both non-quantifiable and can trip-up the share price. Hence, we do not recommend purchase of shares of Family Dollar stock at this time.